Middlesbrough manager Tony Mowbray has said he has refreshed preparations in an attempt to end a run of four straight defeats in the Championship. Boro are yet to earn a single point in 2013 and have slipped to sixth in the table, prompting a rethink of the training methods at the Riverside. 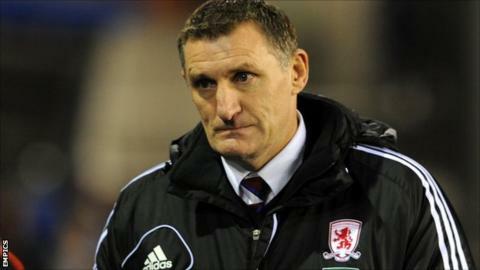 "I have spent a lot of time looking at what we do," Mowbray told BBC Tees. "We have changed a few things to try to snap out of things that could be the stereotype, so we look for reasons." He added: "It's not as if we're talking about four disastrous performances - we have two poor and one and a half decent ones, but it's hard to put our finger on it. "The Derby game we had a lot of injuries but didn't play well, but then we played well for the first-half against Watford and perhaps the belief is eroded by defeats. "There's not a lot wrong other than confidence won't be where it would be if we'd won the last four games." Mowbray's squad could be boosted by the return to fitness of winger Mustapha Carayol after a long absence with a knee injury. The 22-year-old was an unused substitute at Ipswich Town on Saturday but could step into the starting line-up for the visit of Barnsley, although the Boro boss has pleaded for patience. "There's a danger with that. Our supporters have to understand where he came from - Bristol Rovers - the game I saw him live before we signed him they lost 5-0, and yet he can do some things that players on the pitch can't," he said. "We have to put it into context that he's still a young footballer from the lower leagues who has to feel his way in. "He's been out for five months now and it's a big ask when you come back onto the pitch - how your energy levels are, how your body is ready for the combative nature of the Championship. "On the other hand he has to start again at some stage and hopefully he will impact on the game this weekend."